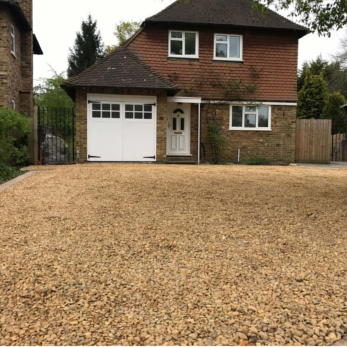 Gravel Driveways Hemel Hempstead can come in a wide variety of colours and sizes and have a variety of uses - whether it is to give a new look to an existing driveway, path or patio or to enhance the appearance of a flower-bed or border. At PaveCraft Ltd, through our suppliers, we have access to all of the most popular and complimentary options and we would be happy to help you find the one most suitable for you. All of our gravel jobs are installed with a Geo-tex membrane fitted underneath as standard, as this is necessary to prevent future weed growth. Any driveway or frequently used path or patio area, where strength is necessary, can be installed using an M.O.T stone sub-base with its own separate membrane to prevent future sink-age.